Jobs Description: Hydrocarbon Development Institute of Pakistan Jobs 2018 are listed below in our site. Ministry of Energy (Petroleum Division) recently announced an advertisement for empty vacancies. 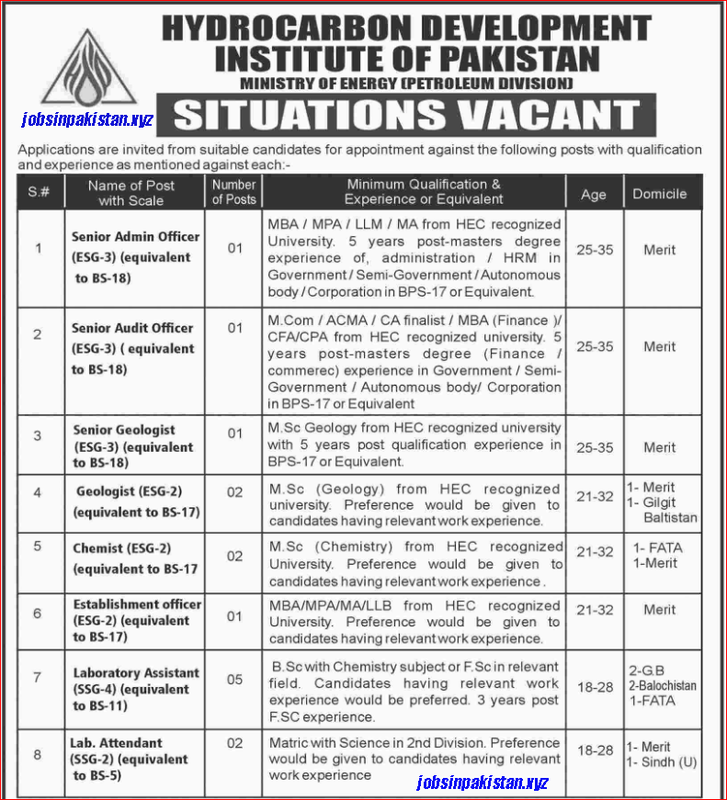 Hydrocarbon Development Institute of Pakistan has required the applications for following jobs. (1) The selected candidates will have to serve anywhere in Pakistan. as the competent authority may decide. (2) No. TA/DAwill be paid for appearing in test/interview. (3) Only shortlisted candidates will be called for test/interview. (4) Candidates shall present his / her original documents duly verified by 11EC along with the set of attested photocopies of relevant documents at the time of interview. (5) All degrees /diploma and certificates must be obtained from HEC recognized universities/institutions. (6) Post qualification experience means experience gain after the final degree required for the post. (7) Employees of Government, Semi Government Bodies / Corporations should forward their application through proper channel. (8) Deposited fee is non-refundable / non-transferable. (9) Age relaxation shall be allowed as per Government Rules. (10) Mobile Phone is not allowed within premises of test centers. (11) Provincial/other quotas as per Federal Government guidelines shall be followed. Candidates applying against quota need to mention in the Application form. (12) The Institute reserves the right to fill or not to fill any post without assigning any reason. (13) Institute reserves the right to fill some or all posts or to cancel the recruitment process at any stage. (A) For the posts of S. No. 1 to 7. please download Application form and deposit slip from Open Testing Service (OTS) website (www.ots.org.pk), pay the prescribed test fee in prescribed bank/branches and send Application forms along with deposit slip (in original) to Manager Operations (HDIP) Open Testing Service (OTS), Office No.01 Central Avenue Road Bharia Town, Phase-VI, Islamabad. (B) Applications submitted by hand will not be entertained. 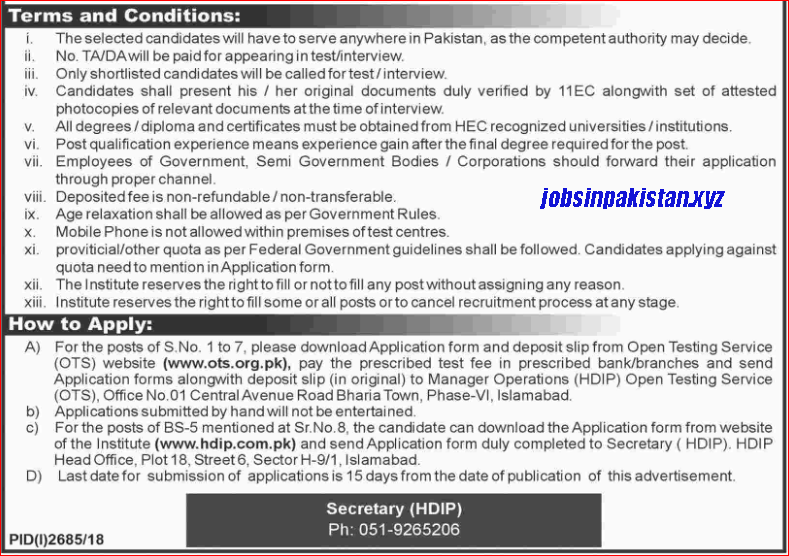 (C) For the posts of BS-5 mentioned at Sr.No.8, the candidate can download the Application form from the website of the Institute (www.hdip.com.pk) and send Application form duly completed to Secretary ( HDIP). HDIP Head Office, Plot 18. Street 6. Sector H-9/1, Islamabad. (D) The last date for submission of applications is 15 days from the date of publication of this advertisement.